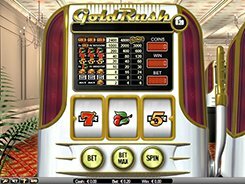 Gold Rush is a progressive video slot from NetEnt equipped with three reels and a single payline. A coin value comes fixed at $0.2, with a single coin accepted per line, so there are only three options for your bet size per spin: $0.2, $0.4 and $0.6. The symbols are gold-filled carts, bars, cherries, fives, sevens and the slot’s logo. 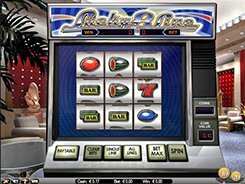 To hit a progressive jackpot you need to place a three-coin bet and roll up three logos across the payline. Playing one or two coins awards 2400 and 4800 coins for that combination. Some symbols do not need to appear on the central payline to produce a win. For example, three cherries or three logos landing anywhere on, above or below the payline do count as a winning combo and pay out up to 3000 coins. 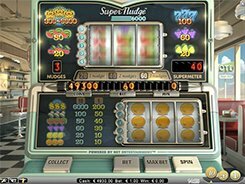 Just like in many other classic three-reel video slots, there are no wilds, free spins or scatters (though the logo and cherry symbols come very close to being scatters). Yet this is offset by a progressive jackpot waiting to be won! PLAY FOR REAL MONEY!